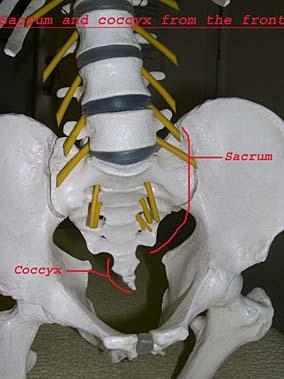 The coccyx is at the very bottom part of the spine, and consists of four or more very small bones stuck together. The coccyx initially joins with the sacrum through a small disc, and is also connected to the sacrum and pelvis with ligaments. 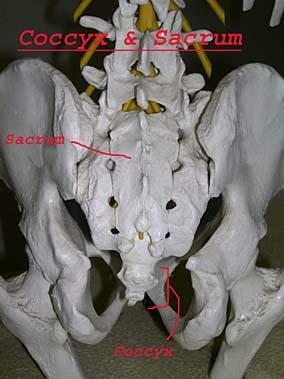 In the coccyx, the vertebrae generally fuse together in early adulthood and may also fuse with the sacrum. It is not clearly understood which part of the coccyx causes pain; probably the ligaments or the joint cause the pain. This condition is more common in women because the coccyx faces posteriorly which makes it more easy to damage and women are more likely to sit on their coccyx as they have a wider pelvis. Often ladies damage their coccyx during childbirth. However, a fall onto your bottom can cause inflammation of the ligaments or injure the joint to the sacrum. In severe injuries a fracture to the bone or joint itself can occur. Repetitive strain from cycling or rowing, or in some cases pain derives from a malformation of the coccyx itself. Rarely bony outgrowths can appear on the coccyx, but only seem to be painful in thin patients who do not have the protection to shield the region from the outgrowth. Other causes of coccyx pain can include cancers but this is very unusual. It is also possible that a twisting torsion to the pelvis as a whole can pull on the coccyx ligaments causing inflammation. This type of problem can be difficult to treat and it is most important to see WHY you have this problem, particularly if you have no history of a trauma to the area. Typically we find that patients with this condition may have a twist to the bones of the pelvis which may pull on the ligaments which attach to the coccyx causing a pain that doesn't go away. Your osteopath will first have to correct this problem to take some of the strain off the coccyx before you will get better. He will probably advise you on management of your pain and you may be given specific exercises to do. Recently I have found that treatment with laser therapy has produced some very successful improvements for this type of condition. With current treatment, prognosis is good and patients usually are able to become pain free. As always an accurate diagnosis is vital before any form of treatment is advised.